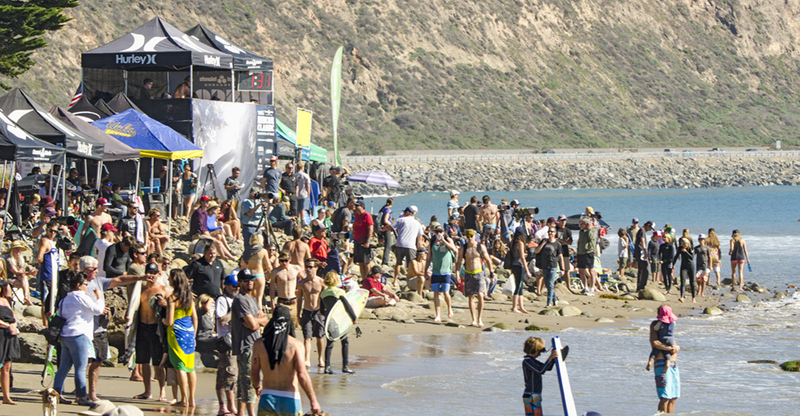 Grandstand and crowd at the Rincon Classic surf competition in Carpinteria, California on January 25, 2015. The final day of the Rincon Classic surf competition was greeted with perfect waves on a balmy January day with plenty of tanned skin exposed to the Southern California sun. It was a hot afternoon while talented surfers worked their magic on clear blue waves. Pro Semi Final at the Rincon Classic surf competition in Carpinteria, California on January 25, 2015. Bright backlit mid day sun reflecting off the ocean is one of the more challenging lighting for photography. 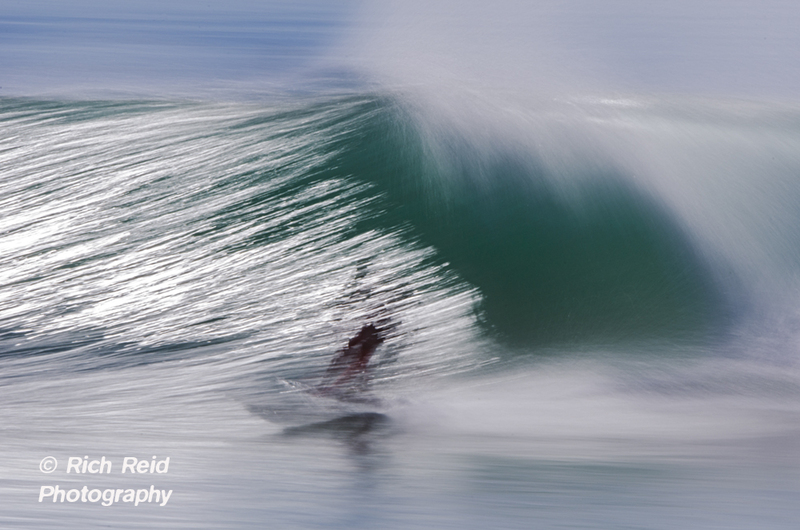 One solution is turning your “classic” stop action scene into a “Surf Art Photo.” Using a combination of filters and a tripod can create magic time exposure images with the right equipment. King of the Queen Final at the Rincon Classic surf competition in Carpinteria, California on January 25, 2015. First is a sturdy tripod placed on a rock well about high tide and the steady stream of spectators. Next are two stacked filters; 4 stop neutral density and a circular polarizer mounted on my 80-400mm Nikon lens. I set my ISO to 100 and varied my shutter speed from between 1/160 second to .6 (or 3/5) second. The best exposure mode was aperture priority which I varied from f/5.6 to f/40 and relied on continuous auto focus for sharpness. Most of the 900 images where shot at 400mm. Gremlin Finals at the Rincon Classic surf competition in Carpinteria, California on January 25, 2015. 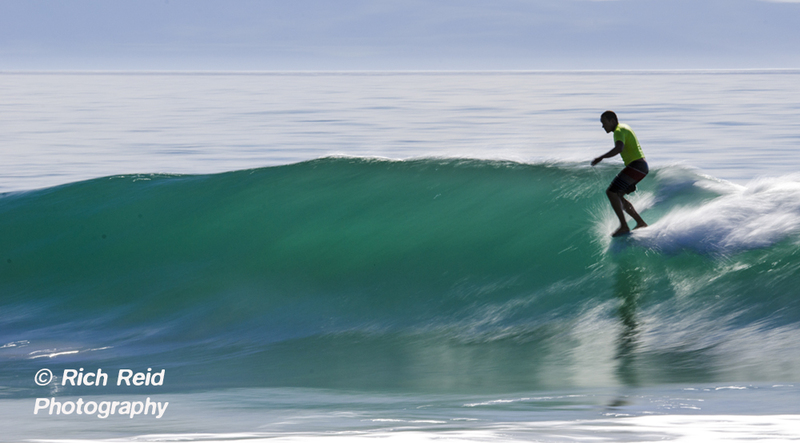 Panning the camera to follow the surfer at slow shutter speed requires lots of luck blended with a tai chi motion. About a dozen serendipitous moments happened on Sunday when everything came together to create that magical image. The selected aperture creates the correct exposure while panning the camera on a talented surfer on a uncrowded perfect wave. The bright sun created the specular highlights on the backlit water and made the waves a transparent blue. Longboard Final at the Rincon Classic in Carpinteria, California on January 25, 2015. 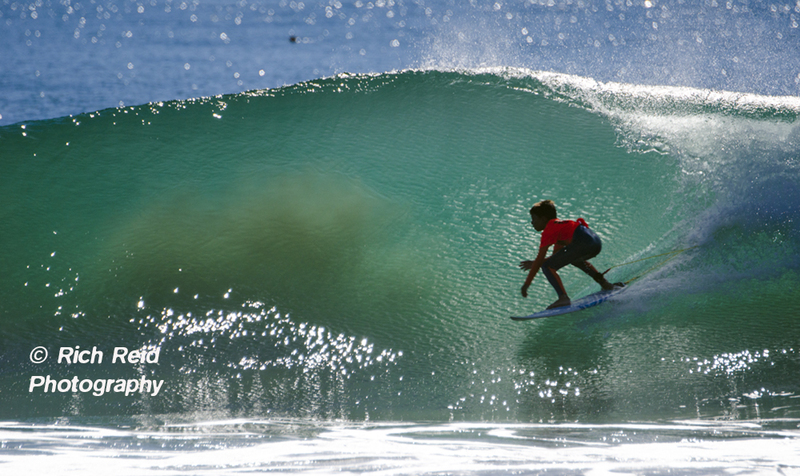 What a magical day in Southern California at the Rincon Classic.